We’re seven days into our month away in Austin. So far, our daily routine has been moving at a more relaxed pace. I love it. Cookie and I are soaking up the sunshine and enjoying our walks around our eclectic neighborhood. I’ve learned how to get to the grocery store and Jeanine and Jack‘s place without the help of my phone, so I think I’m pretty much set! I’m going to do my best not to talk about this city non-stop for the next few weeks, but needless to say, I’m inspired. This risotto is a riff on my mushroom risotto, which is one of my favorites. I used the same cooking method, which requires only minimal stirring. Brown rice offers more nutrients and fiber than white rice and offers more flavor (the more flavor, the better!). Both the rice and the cauliflower bake in the oven at the same time, so you’ll have plenty of downtime to sip on leftover white wine while you wait. I know there are still plenty of cauliflower haters out there. Ali is one of them and she even liked this lemony risotto! Roasted cauliflower is really another animal. When it’s properly roasted, it’s tender on the inside, crispy on the edges and nutty in flavor. It really shines in this peppery, lemony, texture-rich risotto. 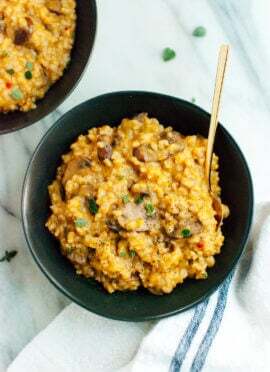 In my mushroom risotto post, I mentioned that I had some ideas for how to make my risotto vegan. My big idea was to add a touch of white miso to make up for the umami flavor of Parmesan, but I tried it and it just tasted funny to me. However! The starch in the short-grain rice is responsible for most of the risotto’s creaminess, so you could skip the Parmesan and add a vegan butter substitute or some extra olive oil in place of the butter. Vegans, please let me know if you give it a try. If you’re on a cauliflower kick, don’t miss my cauliflower soup, favorite cauliflower rice, and roasted cauliflower tacos! You can bake this easy cauliflower risotto recipe in the oven! This healthy brown rice risotto requires minimal stirring and effort. Recipe yields 4 servings. Place your oven racks in the lower third and upper third positions. Preheat oven to 375 degrees. Line a large, rimmed baking sheet with parchment paper. Heat the olive oil in a medium Dutch oven over medium heat until shimmering. Add onion and a pinch of salt. Cook, stirring occasionally, until softened and turning translucent, about 5 minutes. Add the minced garlic and cook until the garlic is fragrant, 1 to 2 minutes. Add 4 cups broth (or 3 cups broth and 1 cup water), cover, and bring to a boil over medium-high heat. Remove from heat and stir in the rice. Cover the pot and bake on the lower rack until rice is tender and cooked through, about 65 to 70 minutes. It will seem pretty dry when you take off the lid, but don’t worry! 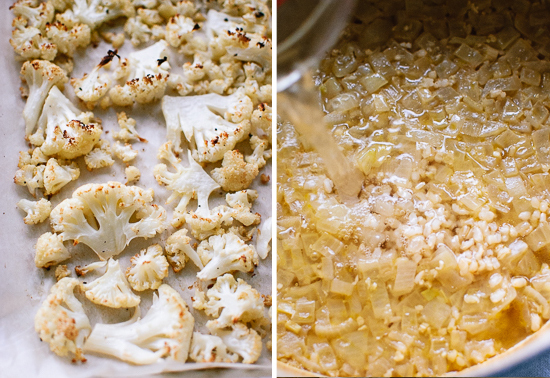 Immediately afterward, toss the cauliflower with 2 tablespoons olive oil on your lined baking sheet. Sprinkle with salt and some freshly ground black pepper and arrange the cauliflower in a single layer on the pan. Roast on the upper rack until the florets are tender and the edges are deeply caramelized, tossing halfway. This took the full hour for me, but start checking the cauliflower for doneness around 40 minutes. In the meantime, toast your almonds in a small skillet over medium-low heat, stirring constantly, until fragrant and turning lightly golden on the edges, about 3 to 5 minutes. Transfer to a bowl to cool. Remove the pot from the oven. Pour in the remaining cup of broth, the Parmesan, wine and butter. Stir vigorously for 2 to 3 minutes, until the rice is thick and creamy. Stir in the salt, a generous amount of pepper, pinch of red pepper flakes, lemon zest and juice. Section off one-fourth of the cauliflower to use as a garnish. Chop any large remaining pieces of cauliflower into more bite-sized pieces before transferring three-fourths of the cauliflower to your pot of risotto. Stir in the cauliflower. Taste and add more salt, pepper or lemon juice as needed. Divide the risotto into bowls and top with the remaining roasted cauliflower and a sprinkling of toasted almonds or fresh thyme. Recipe adapted from my mushroom risotto. *Make it nut free: Skip the almonds. Garnish with fresh thyme leaves instead. This risotto sounds amazing! If you haven’t already, you should check out Easy Tiger Bake Shop on sixth street in Austin. I just love their pretzels! Easy Tiger is on my list! Can’t wait to try those pretzels. Sounds good to me. I’d probably add some cauliflower puree with evoo, nutritional yeast and garlic in it to help with the creamy factor as well as the taste. Yay, more ways to eat roasted cauliflower! This sounds like such a satisfying winter dish. So hot and creamy and delicious. Who could possibly hate cauliflower when it’s roasted and cooked in this fabulous recipe of yours?? Onion, garlic, cheese and wine–simply music to my ears! 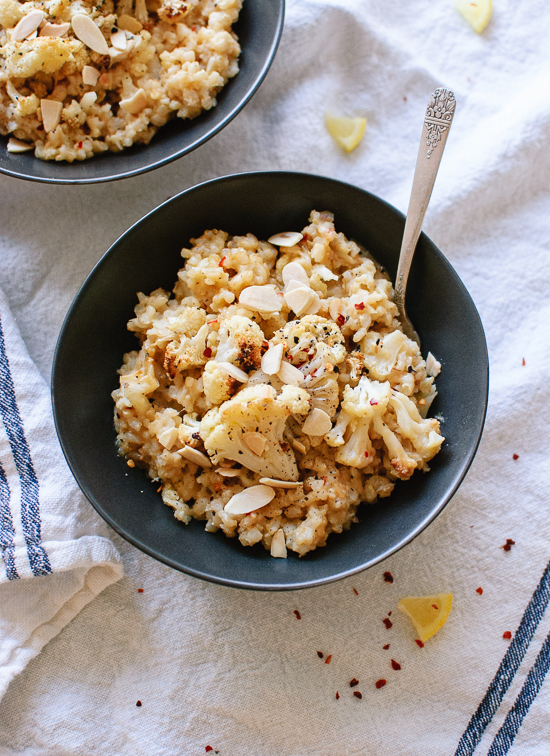 I love roasted cauliflower, can’t wait to try this risotto! This looks amazing Kate – so creamy and comforting! I love risotto! This combination sounds divine! Looks delicious! And please do talk about Austin non-stop!!! I have lately seen it very often, people swaping rice for cauliflower. I would love to try it but I am a little bit scared of dealing with it, haha I think it’s a little bit difficult to manage and cook. Idk I guess I just have to give it a try! I have never tried swapping cauliflower for rice. I just added roasted cauliflower here. It’s not difficult to manage, hope you give it a try soon! Yum! We love cauliflower and so excited to try this recipe out! Ooooh…this looks so yummy. Such a genius idea using cauliflower this way! Cosy but still fresh, loving this! Enjoy Austin! We are heading there in the Spring, would love some recommendations! Thanks, Emma! I’m sure I’ll have a ton of recommendations by the time I leave, but so far highlights have included Elizabeth Street Cafe, Sway, Torchy’s Tacos and La Condesa. Austin has always been on my traveling bucket list — so glad you two are having a great time so far! Aaaand now I’m also adding this risotto to my cooking bucket list — looks amazing! Austin is so fun, hope you get a chance to visit soon! Thanks, Stephanie! Yum! I made this tonight. It was a little soupy and I had to cook it down on the stove some. I used homemade chicken broth instead of vegetable broth. My husband ate every last bite. I’m going to have to try your mushroom risotto now!Thank you. Thanks, Diana! Hmm, I’m not sure why yours was soupy. All of the liquid was absorbed when I took the lid off mine. The mushroom risotto is my favorite, enjoy! 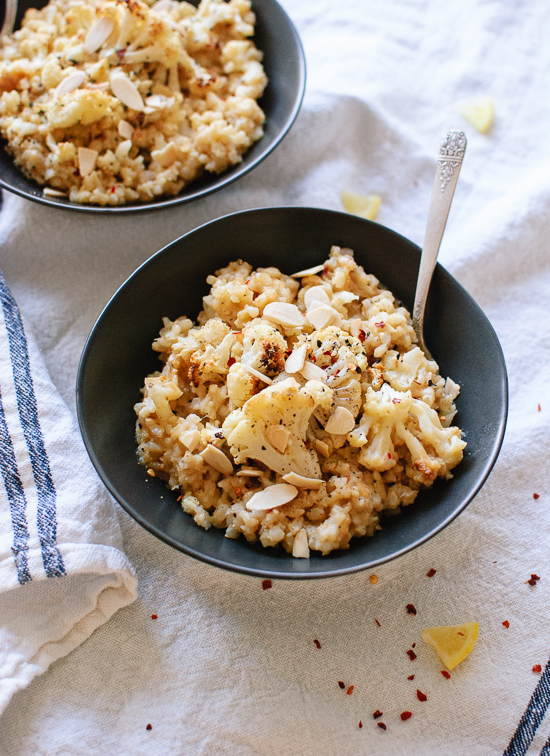 Cauliflower risotto is one of my faves in winter! It is sooo creamy! I never made it with roasted cauliflower though (I usualy cut the cauliflower in small florets that I add in the pan with the broth, so that it cooks with the rice) so I guess I have to give it a try! My tip for a vegan risotto : replace the butter and parmesan with cashew butter + nutritional yeast, both stirred in the rice in the end. It’s creamy and gives a cheesy taste to the dish! Oh yum! That’s a great idea, thanks Nina! Do you recall how much nutritional yeast and cashew butter you used? I know you like yoga… My favorite yoga teacher moved to Austin about two years ago and is teaching at a cute studio called Hyde Park Yoga Company. If that’s close to where you are staying, you should check classes her out. Her name is Jenn Coats. Awesome! Thank you, Margarita. I would like to find a yoga studio here. I tried to go to one downtown but parking was insane! I’ll look up your friend’s place. I’m not vegan, but I hate cheese (I know, who hates cheese?? This girl). I’ve made a lot of vegetable risottos, and simply omit the cheese. It really isn’t necessary, and I don’t feel like it’s missing anything. My cheese loving husband doesn’t even sprinkle any on top! Try it without– you probably won’t miss it! Definitely making this for dinner one day this week. Thanks, Kate! You hate cheese?! I’m flabbergasted. :) I’ve tried risotto without cheese, it’s very good! Hope you both enjoy this cauliflower version. My husband and I are vegan, and I use an Earth Balance/coconut oil/EVOO combo when I make risotto (I wing it…). 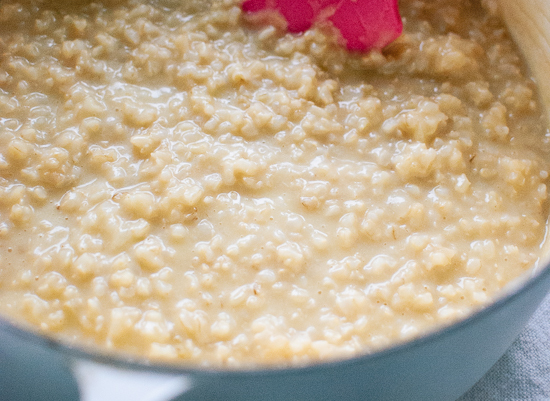 I also use more liquid than is traditionally called for so that the rice maintains its creaminess – no cheese needed! This weekend, I made a lemon and asparagus risotto that was ridiculously good, but I never thought about putting in cauliflower. I’ll have to try it! Your risotto sounds great, Lina! Hope you enjoy it with cauliflower, too. that’s such a great idea to swap cauliflower for rice – always looking for new ways to use it! great idea! I love swapping cauliflower for rice, and your pics making me hungry! I’m so glad that you are all having a great time exploring a new city! And talk about it all you want so I can live vicariously through you while I am trapped here behind my desk! I must admit that I am a non-lover of cauliflower except when it is prepared in particular ways: roasted or raw. 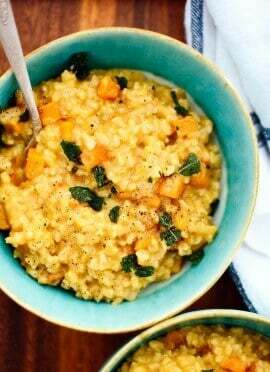 I can’t wait to try this risotto, and I love that it bakes in the oven! Thanks, Amy! We are having such a good time here. Hope you love this risotto! Maybe nutritional yeast could sub in for the parmesan? I’ve never cooked with it myself but one of my favorite vegan salads from this place we get sandwiches from has nutritional yeast coated kale chips and those things taste so cheesy! Maybe so! I bet you could add it to taste. Tried it today! Super delicious. I just substituted the rice with barley. It gave the recipe an even creamier texture. Thanks, Roula! Glad it turned out well with barley! This was delicious and the leftovers I had for lunch were even yummier. The parmesan cheese was a little clumpy…could it have been from using pre-shredded? Is there a trick to it? Hmm, I haven’t encountered clumpy Parmesan. Pre-shredded cheese is often coated with powder that is supposed to prevent clumping in the bag but can prevent proper melting, so that could be it. I don’t think I’ve ever gotten my risotto that creamy before!!! I need to try your method…anything that yields creamier risotto with less stirring sounds good to me! Ali and I are in Austin for the month! We’ve been to the first two places you mentioned, so good. Just added the latter two to our list! Thanks, Brittany! Hope you have a great weekend. Hey Rebecca, thank you! I’ve enjoyed Bouldin Creek Cafe’s offerings twice now. I will have to hunt down those macarons next! Thank you for the recommendations! This is the perfect comfort food. My entire family loved it. Thank you, Heather! I’m so glad to hear it. I am not an experienced cook at all, but was able to figure this out without much difficultly and it turned out deliciously! Thanks for a healthy risotto recipe. Thanks, Jillian! So glad this worked for you. Hope you enjoy my other recipes as well! I made a vegan version – just left out the parmesan and added olive oil instead of butter. It was scrumptious! I didn’t add nutritional yeast because I was pleased with the flavor already, but I’m sure it would add extra yumminess. Thank you, Karin! Your version sounds great to me! Made this one for Super Bowl Sunday (not very traditional, but I had forgotten Sunday was Super Bowl and had already bought the ingredients). I invited my in-laws over to watch the game, and I cooked risotto (and chicken wings) and half-watched the game/commercials. My meat-eating in-laws and sister-in-law really liked it (said it was better than the chicken wings). My vegetarian husband was not so into it…said it tasted like mac-n-cheese and he hates mac-n-cheese. I also couldn’t get my 5 and 7 year old girls to eat it, but they are really picky too. I did add the wine, and there was definitely a wine taste to it, which the kids may have not been so into. The roasted cauliflower was perfect and so easy…I will definitely make cauliflower as a side that way more often. So, mixed reviews at my house, but I will still give it a 5 since lots did really enjoy it. I would like to make this delicious sounding recipe, but I am a bit confused. 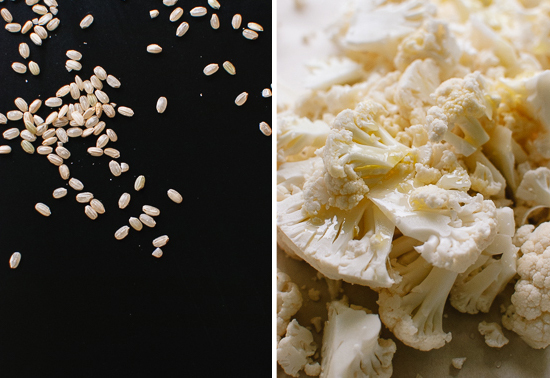 Do you cook the risotto in the oven for an hour and then cook it for another hour while the cauliflower roasts? Hi, Kate. I made this last night and it was delicious. I also left out the butter and substituted extra virgin olive oil (the one I use is on mild to moderate side so it doesn’t overwhelm a dish like this). Served it with flounder filet which I dust lightly with flour and pan-fry in EVOO. Once the fish is cooked, I remove it, add a little lemon and white wine to the pan to create a light sauce and drizzle that over the fish. The subtle lemon flavor so in the risotto and the fish complemented each other very nicely. The family loved it and I may adapt your method to all my risotto recipes. Thank you! I just found your blog today and made BOTH this cauliflower risotto and your chana masala for dinner. They were delicious (but perhaps not meant to go together). My meat-loving spouse and 4 and 6 year old boys loved it too (not an easy feat). The toasted almonds were a wonderful topping. I had to use lime instead of lemon (whoops) because I didn’t have lemons – but the rest I followed including the wine. Delicious!! I can’t wait to make more of your recipes! I had cauliflower to use up, so I searched your site for something to make with it. This was truly delicious! I did substitute 8 oz of water, as you directed, since the broth I had came in a 32 oz container, but did use the optional 1/2 cup of wine, and I don’t think the water took away any of the richness or flavor. This is definitely another one of your great recipes, and I loved how so much of it was done in the oven while still turning out so well. I made this last week. It was amazing! I had leftovers for a few lunches, too. It made my week! I know this isn’t new, but I just came across it – and it immediately became a favorite fall/winter recipe! Kate, you totally nailed the risotto base, and I never intend to make it any other way; this version is so much easier, and the brown rice cooks up perfectly. I made a slight variation last night with roasted lemon slices, jalapeño, and broccoli, and I had to stop myself from licking the bowl…ok, I licked the bowl. Try nutritional yeast instead of parmesan? It really delivers that umami taste. This recipe was delicious! I used long grain brown rice and substituted the Parmesan with nutritional yeast! Didn’t add the white wine but it wasn’t missed. Rice was done in 60 minutes. Yummy and will definitely make this one again! Hi Kate. I have been making this risotto about 6 months now, and it is my favourite risotto of all time. The roasted cauliflower is so tasty. Keep the awesome vego recipes coming, I have yet to try one I don’t like! 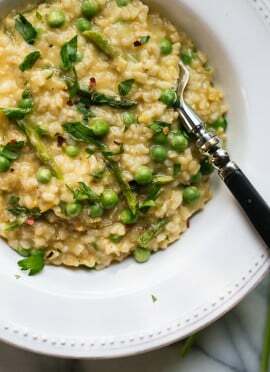 I love risotto and have 3 recipes are always a hit, so am always hesitant to try new ones. I was definitely suspicious of the method, as I’ve never done the “no stir” way before. However, I decided to try it as none of your recipes have disappointed me yet, and sure enough, it turned out fantastic! Love the flavours together. A genuine thanks to you bc I know I can count on your recipes to be a success! Absolutely delicious! Never knew cauliflower could taste that good. Living in very rural England I couldn’t find brown arborio so had to use white. Can’t comment on the difference, obviously but this is on my go to list now. The timings given were wrong for me, 60-70 minutes sounded like an awfully long time so I checked after 35 minutes and it was perfect. Really enjoying your recipes, keep up the good work! Thank you, Neil! I’m glad you were surprised cauliflower could be this good. I appreciate the review!